INTRODUCTION: Although one spine surgeon may decide that a patient needs surgery, another surgeon [e.g. a second opinion] might decide that surgery is “unnecessary”. Here we define “unnecessary surgery” as spinal surgery based upon “pain alone”. That is, the patient has no neurological deficit and no significant abnormal radiographic findings on dynamic X-rays, MR, and/or CT. Surgeons can, and do, debate whether it is appropriate to operate on patients with pain alone. To put this debate in context, however, we need to better understand the number of patients involved and the type of procedures recommended. In this prospective study performed over a one-year period, a single neurosurgeon documented the “unnecessary” lumbar and cervical surgeries planned by other spinal surgeons. BACKGROUND: There are marked disparities in the frequency of spinal surgery performed within the United States over time, as well as across different geographic areas. One possible source of these disparities is the criteria for surgery. METHODS: During a one-year period [November 2009-October 2010], the senior author, a neurosurgeon, saw 274 patients for cervical and lumbar spinal, office consultations. A patient was assigned to the “unnecessary surgery” group if they were told they needed spinal surgery by another surgeon, but exhibited pain alone without neurological deficits, and without significant abnormal radiographic findings [dynamic X-rays, MR scans, and/or CT scans]. RESULTS: Of the 274 consults, 45 patients were told they needed surgery by outside surgeons, although their neurological and radiographic findings were not abnormal. An additional 2 patients were told they needed lumbar operations, when in fact the findings indicated a cervical operation was necessary. These 47 patients included 21 [23.1%] of 91 patients with cervical complaints, and 26 [14.2%] of 183 patients with lumbar complaints. 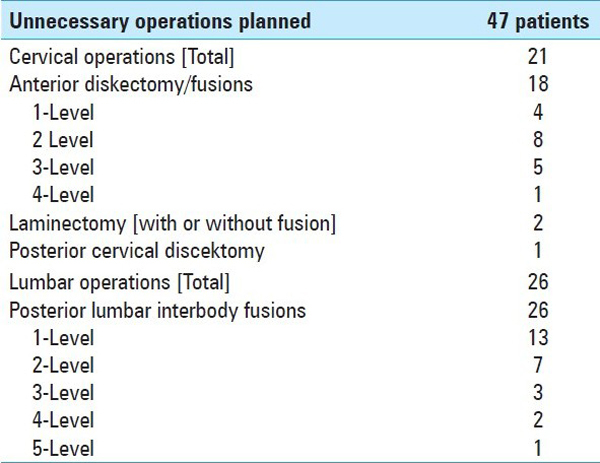 The 21 planned cervical operations included 1-4 level anterior diskectomy/fusion [18 patients], laminectomies/fusions [2 patients], and a posterior cervical diskectomy [1 patient]. The 26 planned lumbar operations involved single/multilevel posterior lumbar interbody fusions: 1-level [13 patients], 2-levels [7 patients], 3-levels [3 patients], 4-levels [2 patients], and 5-levels [1 patient]. In 29 patients there were one or more overlapping comorbidities. CONCLUSIONS: During a one-year period, 47 [17.2%] of 274 spinal consultations seen by a single neurosurgeon were scheduled for “unnecessary surgery”. I have a few, serious issues with the comments made in this article. 1. Yes, it’s interesting to know that 17.2% of back surgeries are unnecessary. BUT, what about the outcomes for the other 82.8% of the individuals who DO end up getting surgery? What about them??? A 2011 review in Spine Journal (the Bible of spinal surgery) reviewed records from 1,450 patients in the Ohio Bureau of Workers’ Compensation database, who had diagnoses of disc degeneration, disc herniation or radiculopathy, a nerve condition that causes tingling and weakness of the limbs. Half of the patients received surgery to fuse two or more vertebrae in hopes of curing low back pain. The other half had no surgery, even though they had comparable diagnoses. After two years, only 26 percent of those who received surgery had actually returned to work. That’s compared to 67 percent of patients who didn’t have the surgery, even though they had the same exact diagnosis. This translates as a 74% failure rate for low back surgeries! It also means you are 257% more likely to go back to work IF YOU DON’T GET SURGERY THAN IF YOU DO. A review in the January 2011 edition of European Spine Journal includes a brilliant review of “the effectiveness of pharmacological interventions [i.e., non-steroid anti-inflammatory drugs (NSAIDs), muscle relaxants, antidepressants, and opioids] for non-specific chronic low-back pain (LBP)”. NSAIDs (n = 4),antidepressants (n = 5),and opioids (n = 8).Amazingly, no studies were found for muscle relaxers! In 2007, a medical practice guideline for low back pain (LBP) was jointly prepared by the American Pain Society and the American College of Physicians, and it recognized spinal manipulation as the only non-pharmacologic method providing “proven benefits” for acute LBP. In November of 2004, the European Guidelines for the Management of Chronic Non-specific Low Back Pain were released. They recommend spinal manipulation as an effective conservative treatment. A lot of what’s considered “standard medical treatment” was listed as invasive treatments, that should NOT be recommended for non-specific CLBP. Bed restAcupunctureEpidural corticosteroidsIntradiscal injectionsIntra-articular (facet) steroid injectionsLocal facet nerve blocksTrigger point injectionsProlotherapyBotulinum toxinRadiofrequency facet denervationIntradiscal radiofrequency lesioningIntradiscal electrothermal therapyRadiofrequency lesioning of the dorsal root ganglionand Spinal cord stimulationOur Low Back Pain and Chronic Neck Pain pages list numerous other studies that suggest that spinal manipulation is highly effective for relieving spinal pain, and have been shown time and again to be more effective AND cost-effective than standard medical care. I can’t say for sure how or why medical authors remain unaware of this massive volume of literature support for chiropractic and spinal manipulation. I do believe its in the best interests of our patients that chiropractors continue to share these materials with their local medical associates.